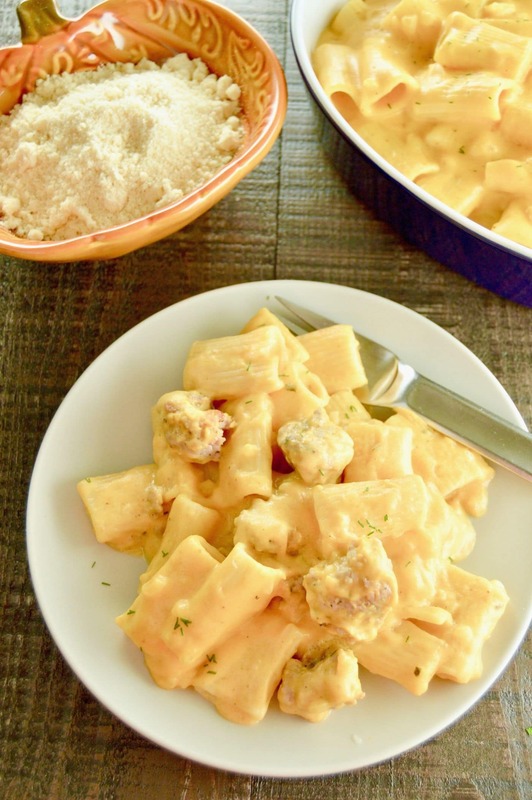 Pumpkin Pasta with Italian Sausage is velvety, cheesy, with hints of earthy pumpkin to lighten the sauce from your regular Mac n Cheese. A simple dinner choice for entertaining on a work night. 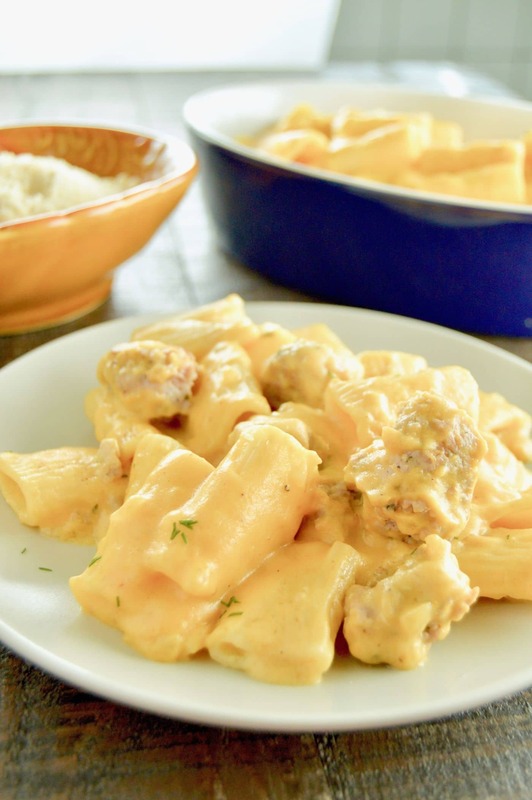 Pumpkin Pasta with Italian sausage is a comfort food recipe that is full of comfort, but because you are using pumpkin too its a little bit lighter than your normal pasta and cheese sauce. 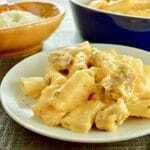 This recipe is adapted from Alton Brown’s Baked Macaroni and Cheese…. 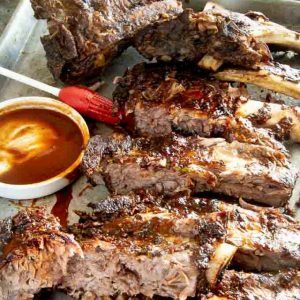 if you are looking for something tried and true and works out every time go try his recipe. The pumpkin in this comes from canned pumpkin. I highly recommend Libby’s pumpkin. Not an affiliate link, its just what my Grandma used, what my Mom used and now what I used! It’s just good! You can make your own fresh pumpkin but cutting the pumpkin in half, scooping out the seeds and then placing on a baking sheet in the oven at 375° for an hour. (Wrap the pumpkin halves in foil). Once finished scoop out puree and blend in a blender. Your pasta will have a little more texture in the pasta. It tastes very fresh but most of the time I find the canned works better. If you have company that is a vegetarian, its really easy to omit the Italian sausage in here. 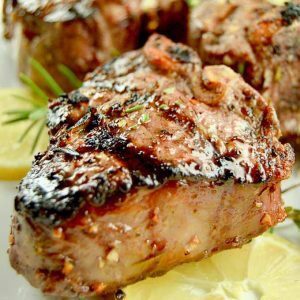 Its cooked completely separately and added at the last minute so you can actually serve both meat eaters and non meat eaters with no additional steps!
. 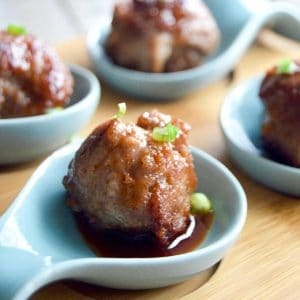 You can also lighten up the calories by using chicken instead of sausage. 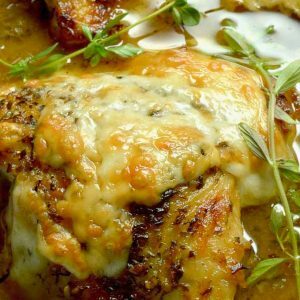 Looking for other comfort food recipes for entertaining? Bring a pot of water to boil, large enough to accommodate the box of pasta. Add 1 teaspoon salt to water, add pasta and cook until al dente. Drain once finished and set aside. While the pasta is cooking, in a medium stock pot, melt butter. Add flour and nutmeg to butter and whisk to remove all lumps. Add pumpkin and stir for 5 minutes. Add milk, onion, bay leaf and pepper. On medium heat, simmer for 10 minutes as it starts to thicken. Remove the bay leaf. Add cheese and stir until well combined and cheese is completely melted. Dump sausage onto pasta and pumpkin and cheese mixture and stir until combined. Serve immediately. Optional, sprinkle toasted pine nuts and parmesan over the top. Well now this is just the perfect fall comfort food! Pinning to make as soon as the weather cools down! I just so happen to have cans of pumpkin that I have been wondering what to do with. And since the hubby has been craving pasta a lot with his Spartan training and regular crossfit sessions. . .well. . .this is perfect for that. This dish looks so creamy and delicious. I love the noodles that you used. All the more yumminess they’ll hold.